Undergraduate research is often cited as one of the most valuable experiences a student can undertake.NC State senior Carrie Sanford will have that opportunity this summer. 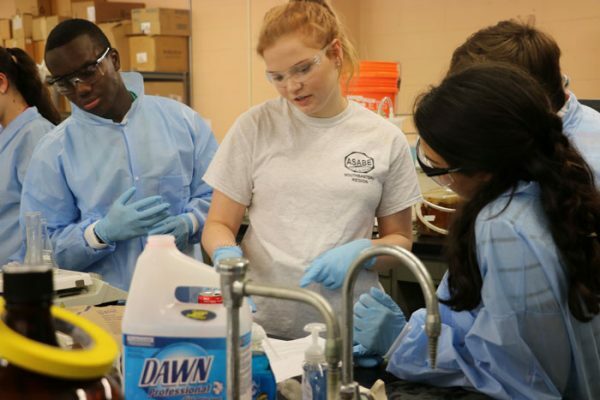 Sanford, a student in the Department of Biological and Agricultural Engineering, was selected for the Atlantic CoastConference Academic Consortium (ACC AC) Fellows Program in Creativity and Innovation. “I will do research in biofuels, studying how growing a microorganism with different sugars affects it ability to produce ethanol,” Sanford explains. This summer, Sanford will work with Mari Chinn and her research team. While much of Sanford’s research will be lab-based, she will have the opportunity to work with Chinn’s research team in the field as well. The ACC AC fellows Program in Creativity and Innovation supports undergraduate involvement at each of the ACC member campuses. Annually, each university receives $12,500 to award up to five ACCAC Fellowships. This program directly connects undergraduate students to core ACC university missions of creativity and innovation. Criteria for awards include, but are not limited to: originality, creativity, innovation, experimentation and intellectual risk. Sanford, who started working with Chinn in the spring, will be able to build on her skills through this summer program. “Through this undergraduate research, I’ll learn more about the entire process of doing research, including writing, running my own fermentations and examining that data,” Sanford says.